It is amazing that although many types of comedy are employed to wring out laughter from the audience, not one of them lands. 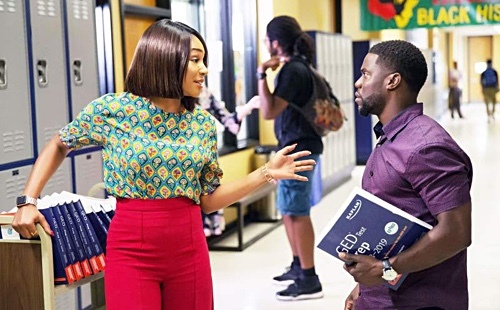 It is even more amazing that despite employing two highly energetic and charismatic performers (Kevin Hart, Tiffany Haddish), they are not funny in it. There is without question that the writing is to blame, or the lack of it. The approach is familiar and depressing: throw anything at the screen and see what sticks. When this strategy fails, and it does, simply allow the actors to yell and scream—as if to mask the picture’s deeply unfunny and lazy nature. A trip to the dentist would be preferred than to have to sit through “Night School” again. There are six screenwriters credited, Hart among them, and it partly explains the material’s lack of focus. Perhaps they all have an idea of what makes an effective comedy and so what results is a Frankenstein’s monster of awkwardly put together jokes that lumber about for a while only to fall apart right before the punchline. But the material requires discipline, to tell a focused story of a man who must go back to high school and deal with unfinished academics, not to make everyone feel included. The film’s running time is almost two hours when it could easily have been an hour and fifteen minutes. The amount of padding here is astounding. Observe the drawn-out exposition. At times scenes are so exaggerated that the movie makes Sunday comic strips look like a documentary. Notice an early scene that takes place in a restaurant. It is actually somewhat amusing when Teddy Walker, a high school dropout who has worked hard to create an image—and only an image—of financial success, gets stuck with an $800 bill. But the writers could not help themselves. They felt the need to show us the character being nasty, to the point where a server loses his job, just so Teddy could have a redemption arc. Sometimes it is enough, even appropriate, to show a problem and allow the viewers to imagine solutions when the film cuts to the next scene. This way, we are engaged, catching up to the material rather than every single beat and punctuation being spoon-fed to us. There is no subtlety, from the human relationships to the struggles that come with having learning disabilities. It easy to see what the writers are going for: Teddy getting his GED as a way to exorcise the shame he felt when he was in school. Because his learning disabilities had gone undiagnosed, he did not get the help he needed. And so he was perceived by his peers, his teachers, and even by his family as stupid or dumb. They may not say it, but it is in how they look at him and how they treat him. Would-be hilarity ensues during night school: from colorful classmates equipped with their own sob stories (Rob Riggle, Romany Malco, Al Madrigal, Mary Lynn Rajskub, Fat Joe, Anne Winters—all of them playing dull caricatures) to sneaking into the principal’s office (Taran Killam) to steal a practice exam. Malcolm D. Lee’s “Night School” is a missed opportunity. For one, it could have been an incisive critique of those inspirational teacher or gifted student movies. I felt Haddish craving to do more with the role. I liked that the premise looks at the marginalized, those who did not get their high school diplomas because life got in the way. But a work cannot stand on its premise alone. Like its protagonist, it must actually put in the work to be funny, smart, and entertaining.